They mount to the wall with a simple bracket (included). The fabric is stain-proof and framed in lightweight black plastic. 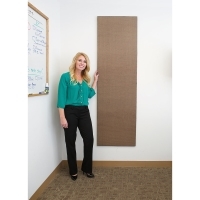 Screenflex Acoustical Display Panels are manufactured in the USA and backed by a lifetime warranty.